For any aspiring photographer looking for a camera to begin their journey, the Ricoh GR should be one of the first stops. The GR packs mid-size DSLR imaging in a pocketable and lightweight form factor that isn’t anything but a pleasure to carry around and shoot with. A compact, 16 megapixel CMOS APS-C sensor camera (that's the same size sensor as in a Canon 7D) with a fixed 18.3mm (28mm on a 35mm sensor) f/2.8 lens, all for the very reasonable price of $800.00. Photography enthusiasts would get the most out of the GR, but the camera is an especially great tool for those looking to get into the trade. Additionally, it’s a great second camera for established professionals who don’t want to carry around that DSLR all the time. There's nothing here that will wow you, but at least it doesn't feel like Ricoh compromised on the build quality of the GR. It's got a very comfortable grip and a wonderfully lightweight magnesium alloy body that altogether weighs in at 8.6 ounces. What the GR lacks in looks, it makes up for in its simple controls and sturdy feel. The controls and power switch placement are all accessible through your index and thumb; which I’ve always thought was the most intuitive way to build a camera. The lens retracts when not in use and keeps the camera on standby at a slim 1.4 inches. The GR does a great job of filling that photographic niche somewhere between my smartphone and my DSLR, both in terms of quality and convenience. In fact, the first thing I noticed was how it takes less than two seconds for the GR to power on, ready to shoot. In every situation that I wanted to take a picture, it was capable of getting exactly what I wanted. The controls are incredibly accessible and very easy to adjust on the fly in order to capture those easy-to-miss moments that occur all too often. The GR has a fixed focal length, which is something to be aware of and might be a deal-break for some. I love it here, though. Being limited to only 18.3mm makes you think about framing much more, and about what your relation is physically to the subject. Moreover, it teaches you how to frame a shot without a zoom, which is invaluable knowledge for a starting photographer. The flash is acceptable and gets the job done without a lot of reach. It's made for a wide lens so if you’re looking to do more interesting possibly studio-based work, your best bet is to just use the hot shoe mount. The detail on the sensor is fantastic. Granted, it's not the 24 megapixel full frame behemoth that the Sony RX1 is, but for not having custom-built Zeiss optics or those extra eight megapixels it sure produces clean, detailed shots. At 100% crop I don't notice any moire and even at high ISO it doesn't get very noisy; The grain manages to stay relatively in sync with the color around it. The GR also shoots video in full HD at 24fps. Its video quality is pretty much what you’d expect out of this little guy. It’s nothing to write home about, but it’ll get the job done. 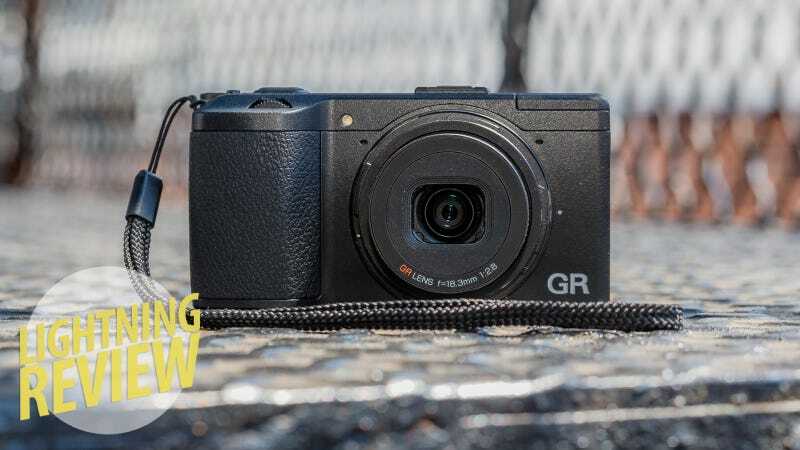 The GR does not reinvent the wheel, but it does bring together a lot of sturdy spokes to make one really small, really cheap, high quality imaging compact camera. Ricoh threw a focus assist light on it too, which is a really underrated and convenient thing to have. Additionally, the LCD screen is so small that it deceivingly makes out of focus or shaky images look like they’re are actually sharp. Around the lens of the camera is an adapter ring that slides on and off without much of a locking mechanism. It comes off so easily that I pulled it out of my pocket to take a picture, put it back in, then looked at the camera later in the night and the ring was gone. There's a menu for filters like B&W, Sepia, and high contrast all accessible by a dedicated button on the left side of the camera. They're trying to appeal to the "Instagram" crowd, but I find it pretty useless, since you can color your photo later when you import them. Shooting RAW captures the image as full color regardless of the filter you use. The LCD giving you the impression of things being sharp really lets you down once you import the photos; I had to learn to shoot at higher shutter speeds to compensate. The camera has a really difficult time trying to macro focus. Even if something is in range and the camera is set to macro focus mode it will, many times, hunt for a focus point indefinitely. To get the macro shots the camera usually hunted for I'd have to set it to a specific focus point. It's affordable, it's lightweight, it's durable and has a fast lens with some serious imaging innards. If you're looking for a good camera to take with you on trips or carry around with you all day this is what you’re looking for. If you're a budding photographer looking to learn technique and don't want to blow your stack on a DSLR just yet, you’d be hard pressed to find a better option. Currently, the closest thing to a mirrorless fixed lens camera like this is the Nikon Coolpix A and it retails for $300.00 more. Specs-wise they break down arguably the same, with the GR being a little lighter. 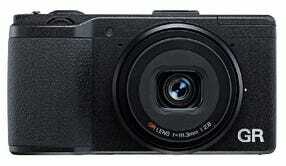 Other mirrorless cameras with interchangeable lenses, like the NEX-3N, are less expensive and less compact. If you want a camera that's nearly as portable as your cell phone that takes infinitely better pictures, look no further. Check out this Flickr Gallery for more GR Sample Photos.